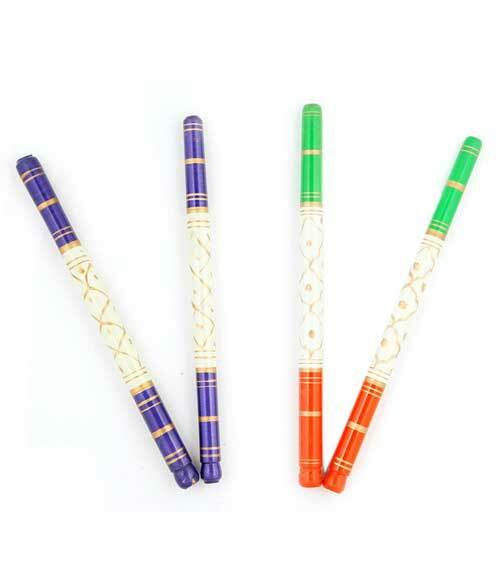 Dandiyas are the sticks used during Navratri Dandiya Raas dance in Gujarat. Since the dance involves the rhythmical striking of the Dandiyas, it also referred as stick dance. Dandiyas are referred as dancing sticks. Dandiya Raas dance take place every night during the nine nights of Navratri. Each dancer participating in Dandiya Raas carries small decorated wooden sticks which are struck in rhythm. The rhythmical striking of the Dandiyas has a symbolic meaning derived from Gujarati culture and Hindu legends. The Dandiya Raas dancers waving the decorated sticks represent harvesters using their sickles on paddy field. This interpretation is based on the belief that Navratri was once a harvest celebration. Another interpretation is that the Dandiya Raas dancers swirling round in circles with their sticks colliding in mid-air represents the warriors in the battle between Lord Ram and the Ravana in the Ramayana.